A lot of plants were earlier used by man in the household, as medicin or in the industry and many of these plants can still be found today. You could call them "living relics of the past". 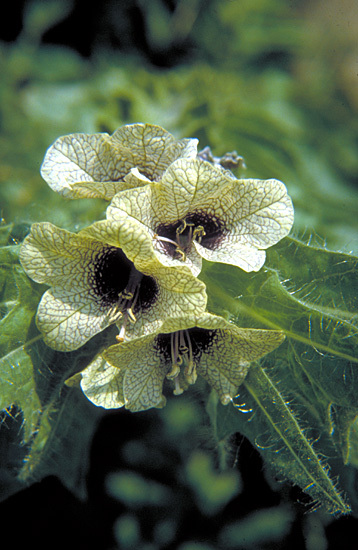 Common species in the cities, towns and villages are Chelidonium majus, Petasites hybridus, Saponaria officinalis, Aegopodium podagaria and Viola odorata. Especially around ruins of old monestaries and castles it is possible to find many interesting species. The right picture shows Hyoscyamus niger. This species often germinates when one dig in the soil near ruins. It is not rare in Denmark and can be found at the Monestary of Øm and the Castle at Kalø. The seeds can survive for centuries in the ground and germinate when exposed to light during digging. Hyoscyamus niger is a very poisionous plant, but was earlier used in small amounts by the munks during the Middle Age for curing many deseases eg. tooth ache. Dipsacus fullonum in the right picture were used for different purposes in the household. 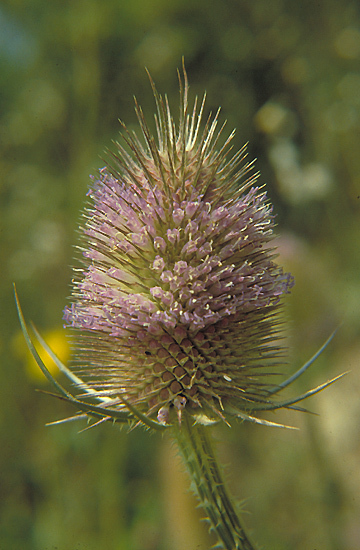 The dried flower heads were used for wool handling and juices from the plant were used for curing head-ache and tooth-ache. Dipsacus fullonum is to day cultivated in gardens and the plants readily spreads to roadsides ets. Nepeta cataria - Catnip - in the left picture is to day a very rare species in Denmark, but has for several years been known from the ruins of the Castle at Kalø. 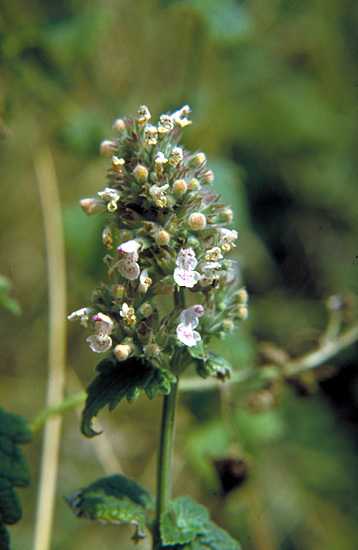 Catnip was introduced to Denmark by munks in the Middle Age for use in their medicine. It was used for curing many different deseases as malaria, leprecy, snakebites, stomach deseases and several others. The name both in danish and english refers to that cats loves to eat the plant and is attracted by the smell. Several species from the Nepeta genus are used in gardens for their beautifull colour and odours. Back to Buildings and ruins.